ein hod: A Journey From Aleppo to Jerusalem At Easter A.D. 1697. 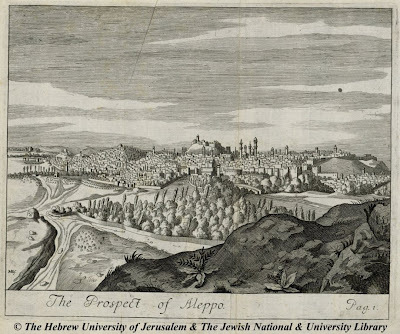 A Journey From Aleppo to Jerusalem At Easter A.D. 1697. At precisely three o'clock in the afternoon, on Friday February 26, 1697, the Reverend Henry Maundrell and fourteen companions mounted their horses and rode out of the city of Aleppo to begin what was to be an 83-day Easter pilgrimage to Jerusalem. It was not an exceptional undertaking; agents from the English Levant Company's office in Syria, to which Maundrell was assigned as chaplain, frequently made such trips at that time of year. But this pilgrimage was to be different, for it was to inspire the eventual publication of a small book of lasting importance, a book which today, 267 years later, remains a minor classic in the overcrowded archives of travel writing, A Journey From Aleppo to Jerusalem At Easter A.D. 1697. 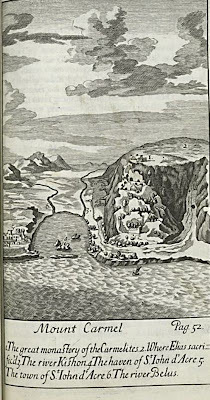 The book, published and republished over the years and translated into at least three languages, began as merely a diary in which Maundrell recorded his observations as he rode across Syria to Latakia, down the Syrian and Lebanese coasts and inland to Jerusalem and the Holy Land, and then returned to Aleppo, visiting such places as Damascus, Baalbek and Tripoli. Maundrell had intended to circulate it among friends and perhaps win a measure of favor with his clerical superiors.